Four new researchers have joined Grizzly-PAW. With these new additions, we have started research on seven of the eight questions that were scheduled for the first year of Grizzly-PAW. Should you want to know a bit more about any of our researchers, their biographies are on the Grizzly-PAW website. This summer’s field season has been very busy. Bear capture activities by Gord Stenhouse at fRI are ongoing until the end of June. Ethan Berman (Q1.2) just returned from a short trip to retrieve data from his snow monitoring equipment. We will be using the same stations to monitor vegetation phrenology over the summer. From UofA, Emily Cicon (Q1.3) isin the field this summer, collecting songbird data from different areas in the Yellowhead region. Chris Souliere (Q2.2) is also in the field for his work on grizzly bear food supply, and will return at the end of the summer. Luciene Kapronczai (A.K.A. Lucy) is a MSc student at the University of Saskatchewan Toxicology Centre. She completed her Bachelor of Science degree in Toxicology at the U of S and has spent the last 6 years working in Dr. David Janz’s Biochemical toxicology lab as a research technician and lab manager. The majority of her lab work has consisted of performing ELISA based hair analysis in wildlife. Along with quantifying hair cortisol, she has aided in the development and adaptation of protocols for quantifying testosterone, progesterone, and estradiol in the hair and whiskers of various species of mammals. 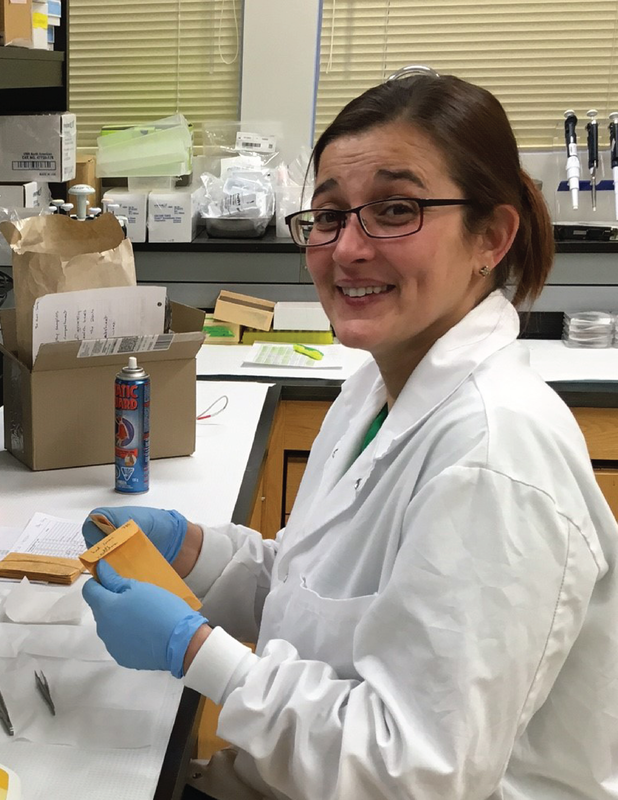 The bulk of her hair analysis has been with the Foothills Research Institute’s grizzly bears but she has also worked with hair and whiskers in Northern elephant seals, moose, caribou, muskrats, horses, and several ice seal species. Her graduate research will focus on quantification of steroid hormones in grizzly bear hair and developing a proteomics technique to identify and quantify a suite of proteins to aide in early detection of changes in reproductive status, energetics, and physiological stress in grizzly bears inhabiting a changing environment. Growing up on a farm in Saskatchewan, Lucy was surrounded by a variety of animals and was known to bring home strays and orphans of all kinds. Lucy’s love of animals along with her interest in chemistry and toxicology brought her to this current study, which she is delighted to be a part of. She has had a variety of professions from hair styling to large format digital graphics. During her undergraduate days she worked with the Canadian Centre for Health and Safety in Agriculture on a pilot project that used longitudinal analysis to look at lung function decline in potash miners. She has also spent the last 25 years working as a standardized patient for the Licentiate of the Medical Council of Canada and the Pharmacy Examining Board of Canada. In her spare time, she enjoys reading, sketching, painting, and loves cooking and baking. She has a love of acting and spent over 30 years on stage. Lucy loves to try new things and travel when opportunities present themselves. Mathieu Bourbonnais is researching Q3A.1 under the supervision of Chris Darimont at the University of Victoria. Among the primary goals of his PhD research has been exploring how grizzly bear movement patterns are influenced by spatial and temporal change in landscape conditions and environmental dynamics. Previous research has shown grizzly bear habitat selection, health, and mortality are strongly influenced by anthropogenic and natural disturbance, land cover, and resource (i.e., food) availability. What is less clear, is how their movements and space use are influenced by these factors. For example, how are the daily movement rates and seasonal ranges of individuals influenced by road and forest harvest densities, as well as landscape productivity, and have these patterns changed over time? By quantifying movement patterns of individuals, we can begin to develop a more complete understanding of grizzly bear population movement and behaviour to support conservation and management efforts. However, providing population scale estimates of movement parameters requires positional data from multiple individuals over large areas, as well as landscape and environmental data that matches the temporal span of the movement data. Thanks to the collaborative efforts of the GPAWS research group, broad scale grizzly bear movement and landscape data are available to help answer these questions. For this portion of his research, he used GPS telemetry data, collected by the fRI Research Grizzly Bear Program in the Yellowhead and Grande Cache bear management units from 2001 to 2014, to quantify 219 individual movement trajectories. One of the main challenges of working with GPS telemetry data collected over 13 years was the irregular sampling frequency. Prior to 2006, much of the GPS data was collected at 4- or 5-hr intervals while improving collar technology and battery life allowed higher temporal resolution (20- and 30-min, 1-hr) data to be collected later in the study. Differences in sampling frequency, as well as missing data, are problematic when estimating movement parameters including speed, turning angles, and distance travelled, often requiring GPS data to resampled to the lowest temporal resolution resulting in a loss of information. To overcome these limitations, he fitted each of the 219 trajectories as a continuous-time correlated random walk which models the velocity autocorrelation as a continuous process allowing positions to be predicted at a desired resolution (Fig. 1). Each trajectory was simulated 5000 times and positions were predicted at a 1-hr resolution. I also used the individual CTCRWs to simulate 10 000, 1-min quasi-continuous trajectories to quantify the utilization distribution and 99th percentile range during the hypophagia/mating (den emergence until June 30), early-hyperphagia (July 1 – 31) and late-hyperphagia (August 1 until den entry) seasons (Fig. 2). The first Grizzly-PAW AGM is planned for September or October. At the AGM, PAW researchers will present the progress from our first year of operation. The plan is to tour some of our field data collection sites. All Grizzly-PAW industrial partners and staff of supporting organizations are invited to attend this meeting. More details to follow soon.